Here's yet another cable management idea if you're one of those kinds of people who just can't bring themselves to throw out a cable you're no longer using. We understand; there's a slim chance that one day you might just need it. Whatever the case, what you should also be saving is those empty toilet paper rolls. 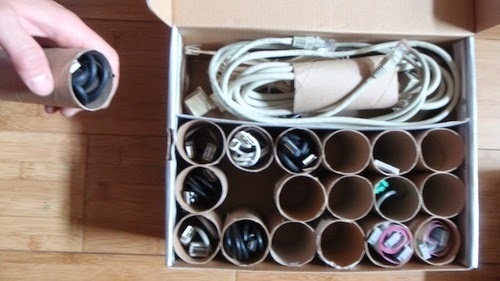 Keep your cables organized and tangle-free by sliding a cable into a toilet paper roll and neatly packing them in a box. This trick will keep your cables mess-free and makes for easy access to the one you need if that day ever comes.